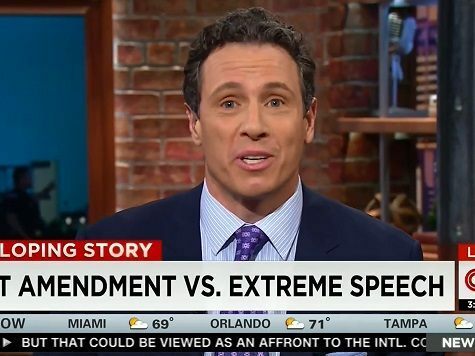 Early Monday morning, Chris Cuomo, co-anchor of “New Day,” the failing morning show on the left-wing CNN, compared a majority of Americans concerned with domestic security to Americans who, in a 1938 poll, wanted the United States government to refuse Jewish refugees fleeing the hell of Nazi Germany. In one fell swoop, Cuomo not only smeared the American people, he downplayed a deeply shameful period in our history. In the wake of the recent Paris terror attacks, to have a major network news anchor openly compare a majority of present-day Americans, worried over national security, to American anti-Semitism from nearly 80 years ago, shows a serious ramping up of the hateful and divisive rhetoric the DC media is willing to use in order to protect Barack Obama. In the past, Cuomo has pledged to use his “New Day” perch to help the White House pass its big government agenda. Nevertheless, even I’m surprised he would go as far as to smear everyday Americans in such a nasty and historically-illiterate way. [Trump] is playing into a “Us versus Them” mentality. Look at the numbers on the Syrian refugees. Look at what the American people say [Only 28% support Obama’s plan to resettle 10,000 Syrian refuges]. We haven’t seen numbers like this in America since 1938, when people were obviously desperate., obviously running for their lives; and yet the fear of what they may mean to the United States overcame any of the rationality of that fear in and of itself. Fifty-three percent are with him. Fifty-three percent believe it’s “Us versus Them,” and Donald plays into it very well, he believes it as much as they do. One fact the DC Media has coordinated to downplay is that ISIS has promised to seed these refugees with terrorists. Moreover, early reports indicate that in at least one or two cases, ISIS kept that promise in Paris. This is what triggered the concern, not bigotry. This country has been accepting Middle Eastern refugees without complaint for more than a decade. But now, simply because we want a pause until additional security protocols are in place, CNN anchors are smearing Americans — attacking them as bigots. To make this comparison is also an injustice to Nazi-era Jews fleeing what was, even in 1938, horrific persecution under Adolf Hitler. Democrat hero, Franklin Roosevelt, himself an anti-Semite, not only caved to America’s prejudices at the time, but his own. Countless Jewish lives that could have been saved were not — not due to security concerns (Hitler was not pledging to seed the refugees with terrorists) but due to the naked anti-Jewish bigotry of the times. Another fact Cuomo and the rest of the DC Media refuse to address is that President Obama has the power to save all Syrian refugees, not just 10,000. But these people don’t care about refugees. They just see them as partisan props to bash the GOP with. If they did care, the DC Media call would be on to set up American refugee camps in the region protected by no-fly zones. Many in the Republican presidential field want to strengthen screening of Syrian refugees AND save all the refugees with a no-fly zone. Democrats, Obama and the DC Media do not. Who’s the real villain here?